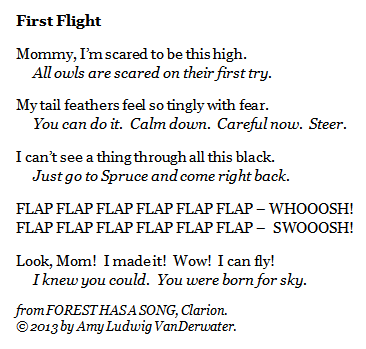 The Poem Farm: First Flight - From My New Book! First Flight - From My New Book! Students - Today's poem is from my new book, FOREST HAS A SONG, illustrated by Robbin Gourley and to be published by Clarion next month. You probably already noticed that this poem goes back-and-forth in a conversation between a mother and baby owl. My own parents are very encouraging, and they always told me that I could do anything. Maybe this is why I wrote about an encouraging Mommy owl. Structure-wise, this poem is written in rhyming couplets (two lines at a time), each with one child line and one mom line. One line only is not written in conversation, and that's stanza 4. Why not? Well, it's all sound effects! Or as we say in poetry-land, it's onomatopoeia. 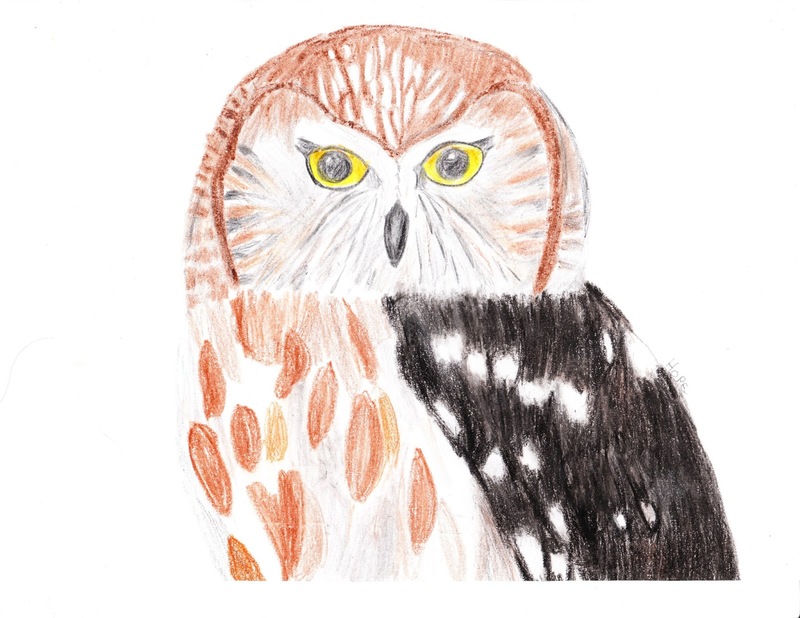 This owl verse also uses a technique called personification which is when a writer gives a non-human characteristics that are human. You can see how this little owl has feelings just like a nervous-child might feel, just like I have felt before. If you're about to sit down to write, you might wish to try thinking about a real feeling that you have had in your life. Maybe a surprised or excited feeling. Of course you can write about your feeling as it is...or maybe you will want to imagine what kind of animal might feel that same feeling and when. Either way gives you a secret passage into a poem of your own. I wrote FOREST HAS A SONG, including this poem several years ago, and it is very exciting (and hard to believe) that my book will be out next month. To keep track of news on the book, I have created a little home just for it here. YAY! A first glimpse, and it is just lovely. I'm so happy for you!!! Wonderful. Can't wait to get my hands on the whole book! So beautiful! I can't wait for the book! Congratulations Amy! What a delightful peek into your forest of treasures! Simply lovely! So happy for you. Can't wait to see the book :). I love all of your ideas for students (and grownups) to try writing like you! I am going to give it a go. I thought I sent a comment, but clearly it didn't make it! This is just like parents feel, Amy, so dear. I can't wait to see what else your book has in store! My 3rd grade student and I like the poem. We liked that it had rhyming, personification, and onomatopoeia all at the same time. We think it's cool that you published your book! Love the poem, Amy. I'm on my way over to Amazon right now to order (or at least to pre-order). I can't wait to read more! Just lovely...I love owls also, and I can't wait to get Forest Has A Song. Just discovered you from ThinkKidThink.